The CES 2013 may be over for another year and as usual we’ve seen some stunning products and devices launched. However there are always some duds at this type of event and we thought we’d let you know about two of the most stupid launches at CES, the HAPIfork and the iPotty toilet trainer. No doubt someone will say they find these products to be innovative and that they will be useful but we can’t help feeling those people may be few and far between. We’ll start off with some details about the HAPIfork by HAPILABS and as you might expect this is a fork. Not an ordinary fork of course because the HAPIfork is designed to help the user eat more slowly. This can help people to lose weight because the stomach only feels full around 20 minutes into a meal so if you eat too quickly you probably eat more than you need. Also eating too quickly isn’t good for the digestive system and can lead to gastric reflux. The HAPIfork helps you to eat more slowly, monitors and tracks your progress and an indicator light signals when you are eating too fast. It measures ‘fork servings’ (that’s every time you lift your fork from the plate to your mouth), the amount of time between fork servings and the time taken to eat a meal and also comes with an app. The item hasn’t been released yet, nor is there a price available but if you are interested by any chance you can register for updates at the HAPILABS website. You can also see a video of how the HAPIfork works below this story. Personally I would have thought it best to save your money and merely slow down your eating yourself, either just by taking your time or mentally counting seconds between mouthfuls. As for the indicator light flashing if the fork decides you’re eating too fast that’s something that might just make me want to throw it across the room! This may be purely coincidence but when we visited the HAPILABS website we noticed a counter in the top right corner labeled ‘total HAPImoments and we couldn’t help noticing the very small print underneath saying that the counter will start on April 1st, 2013. Mmmm, coincidence or not? Moving on to the iPotty and we almost couldn’t decide if this is brilliant or just totally idiotic and concluded on the latter. This is aimed at helping parents potty train their kids and is a combined potty and iPad stand to keep them occupied when doing the deed. To be fair many people seem to be under the impression that this is a fantastic product. There’s a lid on the seat, a pee guard and a plastic sheet that fits over the iPad for splash protection. 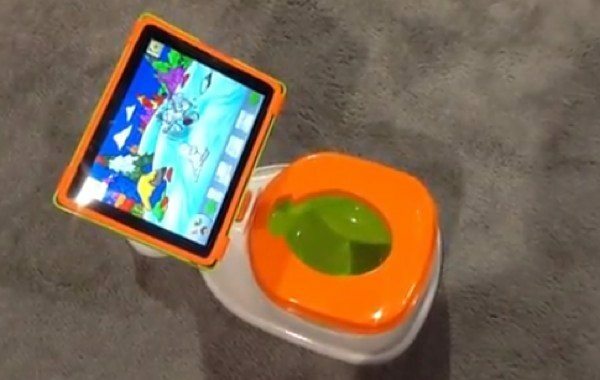 Apps for potty training can be used while on the iPotty or the iPad can just be used to encourage the little one using it to stay there for as long as it takes. The iPotty costs $40 and will release in March and again we’ve embedded a video of it below this story for you to peruse. Again, purely on a personal level, this sounds all a bit desperate to me. Are we really going to raise our kids so that they can’t go even 5 or 10 minutes without a screen in front of them and having to be entertained at the most basic level. A lot of good thinking has gone on over the years in lavatories and it seems a shame to think that would disappear. On the other hand I suppose devices are very much part of everyday life and we know that many adults can’t visit the toilet without a gadget in hand (you know who you are!). We find these items from CES intriguing but totally daft but really want to know what our readers think about them. Do you think they’re stupid or brilliant? If you like them, which do you think is the most useful? Do you look forward to a future where kids toilet train with an iPad or do you think the world has gone mad? Let us know with your comments. Well, I invite you to try by yourself :)) Experience and our own surveys say eating slowly is not that easy for most of the people! When you want to eat more slowly, there are a number of things that you can do: you can count up to twenty in your head between servings, or you can drop your fork on the table after each bite, etc… This can be easy to do for one or two meals, but when youâ€™re sharing a meal with family and friends, thatâ€™s probably not the way you want to enjoy the moment. Thatâ€™s where the HAPIfork can help! With gentle signals that alert you when you are eating too fast, it allows you to eat mindfully while keeping the social and enjoyable dimension of what a meal should be. We had many opportunities to discuss this topic with behavioral specialists who have been very supportive of new tools and ideas that can help people change their habits. And HAPIfork is definitely an excellent tool in changing eating habits when it comes to eating. With HAPIfork, it is not the fork that controls you and tells you what to do, rather the HAPIfork enables you to take control of your health by being informed of your eating habits. At HAPILABS, we believe that you can improve your quality of life by taking small steps to change bad habits. If, like us, you believe itâ€™s possible, we need your support: join the HAPI revolution and help us reach out to other people and help them become healthier and HAPIer. About the counter starting on April 1st, 2013, you’re correct, it’s not the wisest date we could have chosen… March 31st would give you more trust in us!